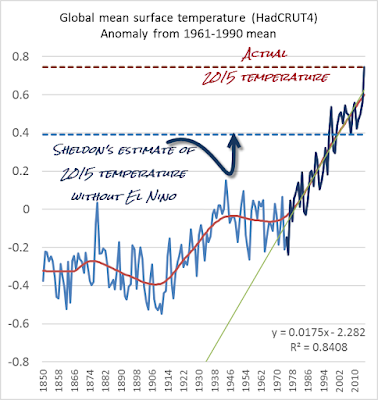 How much of the 2015 temperature increase do you think is due to el Niño, and how much do you think is due to AGW? Do you see what Sheldon did? 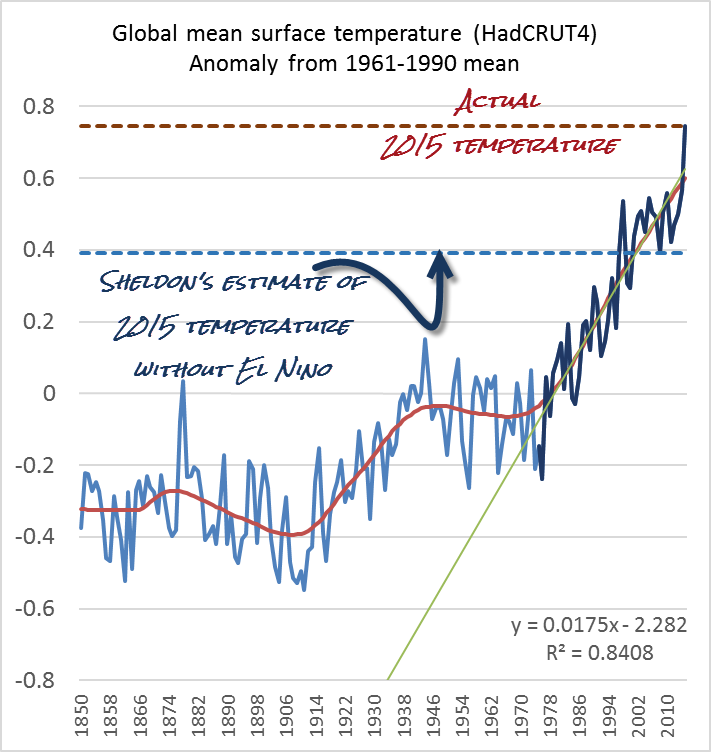 Using Sheldon's numbers, without the current El Niño, the global mean surface temperature would be back to what it was twenty years ago! Update: In the comments Sheldon clarifies (I think) that he was only meaning to compare the two Decembers. He didn't mean to argue that El Nino contributed most of the warming for the entire year of 2015, only for the month of December 2015. Or I think that's what he's saying. There are still some inconsistencies in his article, if that's the case. Twenty one times greater than the linear trend from the most recent change point (1970). As you read the following quotes, remember that this analysis showed that El Nino was responsible for around 95% of the temperature change between the end of 2014, and the end of 2015. El Nino caused an increase in temperature of about 0.32 °C, but the climate scientists claim that it was only a few hundredths of a degree. All of those scientists certainly seem to be singing from the same songbook! I would like to see these scientists justify their comments, using numerical calculations to show where they got their figures from. I have fully documented my method here. If anybody can point out an error in my results, then please let me know. Gavin Schmidt estimated that El Niño contributed about 0.07 C to the 2015 average temperature. As mentioned in the article: "Schmidt’s analysis uses one indicator of El Niño conditions, known as the “Oceanic Niño index” (ONI)." 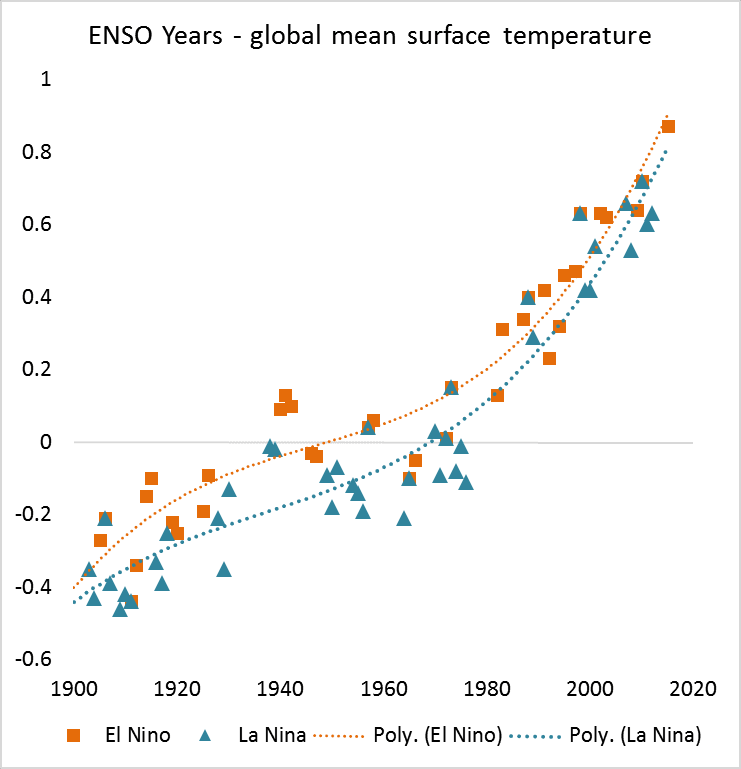 Thomas Cropper estimated that El Niño contributed about 0.09 C to the 2015 average. As mentioned in the article, his estimate was based on the Multivariate ENSO index (MEI), which was used by Foster and Rahmstorf (2011). The MEI is based on six variables which can quantify El Niño and La Niña events – sea level pressure, surface winds in both north-south and east-west directions, sea surface temperature, surface air temperature, and the fraction of the sky covered by cloud. So where did Sheldon go wrong exactly? As pointed out in Roz Pidcocks's article, "it’s important to look at any individual year in the context of the longer trend". Month to month and year to year data is noisy. It's the long term trend that's important. Sheldon also went wrong in his surprise that the scientists' estimates were not too different. And he went wrong by ignoring the explanation of how the scientists reached their estimates of El Niño's contribution, and asking how they justified their estimates. Sheldon made another error in taking no notice of any of the responses to his question and comments here at HW. Finally, he went wrong because from here he trotted over to WUWT to repeat his mistakes. Incidentally, it's expected that El Niño will have a bigger influence on this year's average surface temperature. That's generally the pattern of a strong El Nino. Since the article at HotWhopper and the article at the Climate Brief, Tamino has written an article as well. Sheldon must have missed it. Pointman builds a strawman. Not every year is the hottest on record. Last year was, and the year before that was, and so were 2010 and 2005 and 1998 at the time. There hasn't been a "coldest year on record" for more than 100 years. Every year is the hottest one, every year and every year ad nauseum. No wonder people no longer believe the alarmists. I thought Werner Brozek was smarter than this. I was wrong, and probably shouldn't have been surprised. Thank you for a well presented argument! Personally I find nothing at all surprising in climate scientists talking up the global warming aspect and underplaying the El Niño contribution. It’s what they do, but it will catch up with them one day. It was hysterical watching the warmists cheer on the El Niño like it was some kind of a football game. They were too ignorant to realize that the huge temperature forcing impact of El Niño and oceanic circulation in general implicitly revealed the minimal forcing effect of additional carbon dioxide upon atmospheric temperature. The oceans are the big dog in the temperature story. Carbon dioxide is just a bunch of fleas on the dog. What are they going to do when the anomaly comes crashing down at the end of this El Niño? When you *really* want to believe something, the facts are nearly irrelevant. We can stop pretending that Global Warming (AGW) has a statistically scientific impact on global climate when there is no evidence for the claim (besides deception, conjecture, and hyperbole). kokoda later admits that for him or her, numerical analysis is not important. Numerical analysis is not important. “We think” is the science of the day. Why use discredited surface data which everyone knows is fraudulent? So stupid that it hurts - but good enough for WUWT. Do I have this right? We now have WUWT telling us the world is warming at 0.175C per decade? And hasn't Walker just shot down in advance their predictable claims of global cooling after the El Nino. Isn't that a complete reversal of their position? excellent question. What are chances any one at WTFUWT will ever answer? No, their position has never emphasized self-consistency across arguments. WUWT adopts a huge number of mutually contradictory positions. Do the acolytes know this? At some semi-conscious level I suspect so. DO they care about this? Definitely not. Has anyone asked anyone there why this is the hottest El Nino year on record? That sort of takes the El Nino aspect out of play. Did you see in my article that I said "The total global warming over the years 1975 to 2015 is almost 0.72 °C". Are Deniers allowed to say that? I am not the one who has mixed up the monthly and annual data. "In other words, he not only mixed up monthly data and annual data, he seems to have decided that without El Niño, the annual global mean surface temperature anomaly would be 0.745C minus 0.3535 C = 0.3915 C."
I never made the calculation "0.745C minus 0.3535 C = 0.3915 C". You did. I never used the value 0.745C in my article. That is the Hadcrut4 annual anomaly for 2015. It is the average of the 12 monthly anomalies for 2015. Your calculation gave 0.3915 C, which you said "would be back to what it was twenty years ago!". Now my figure of 0.6515 is also equal to the December 2014 anomaly (0.634) plus the temperature change from Global Warming (0.634 + 0.0175 = 0.6515 C). This is just above the December 2014 anomaly. In other words, without the 2015 El Nino, the temperature would be back to just above the December 2014 anomaly. This is "one year ago", not "twenty years ago". And when you wrote: "I calculated the temperature change from December 2014 to December 2015. This gives the temperature change over 1 year." That's misleading at best. It is just the difference between Decembers, not the temperature change "over one year". The average temperature change over the year is worked out from the difference in the annual averages. The difference between the 2014 mean and 2015 mean is 0.178C. You say:"If you want to work out the global mean surface temperature anomaly without El Nino, then you must subtract the warming due to El Nino" - so far so good. That's what the scientists who spoke with Roz Pidcock did. This next bit is where your calculation went awry, or at least you didn't make yourself clear. You took the difference between Decembers only, not the full year difference. Then you took the anomaly for Dec15 of 1.005C, deducted the 0.3535C then deducted 0.0175 and said "voila", it equals Dec14 anomaly. Well, duh! Then you said: "In other words, without the 2015 El Nino, the temperature would be back to just above the December 2014 anomaly. This is "one year ago", not "twenty years ago". Fair enough. I indicated that I couldn't follow what you were trying to argue. From your comment you seem to be saying that you are only talking about the month of December. However if that's the case, why are you mixing it up with the scientists' estimates, which were for a full year, not simply one month. From where I sit, you didn't make it clear that you are onlyreferring to the December anomaly, not the full year's anomaly. In fact you queried the fact that the scientists who were talking about the full year got a different answer - here and here and here and here. Of course they did. They were looking at the effect of El Nino on the entire year of 2015. You are only looking at one month - December 2014 vs December 2015. January to January: 0.165C, February to February: 0.347C, March to March: 0.12C; April to April: -0.001C, May to May: 0.097C, June to June: 0.112, July to July: 0.155C; August to August: 0.074C; September to September: 0.196C; October to October: 0.185C; November to November: 0.313C. Sorry, I forgot to put this in my last comment. I am planning on writing an article on the Pause. Is it ok if I come back to HotWhopper for some help with it? Sure, Sheldon. You're welcome at HW. Here is an article to whet your appetite. Sheldon: perhaps you could compare the Monckton Pause as of Jan 2015 (start-date/length) with the Monckton Pause as of 2016 and work out how much of the difference is due to El Nino. If Sheldon can't find the information, Monckton's fake pause began in December 1996 (as of January 2015) and May 1997 (as of January 2016). I haven't done the maths, but I guess the reason why the start changes is simple - the world has been warming (and it's not just El Nino). Whoops, can't even read my own work. That should read March 1997 (as of January 2016). Any article on the "pause" should try to explain why the start month for the "pause" keeps changing. How does that happen? According to Monckton, some mysterious and catastrophic worldwide event (that no one noticed) stopped the Earth from warming around 1997 or so. It happened, this momentous Pause Bringer, and the world hasn't warmed since. But its date of this Event keeps changing. When there are warm months, Monckton claims the start date for the "pause" moves forward in time. When there are cooler months, he claims it moves backward. What is the physical process that reaches into the past to move that Event forward in time when we have warm months now, and backward in time when we have cold months? Curious minds want to know. We also want to know what this Mysterious Event was. What, exactly, changed in the Earth's climate system to cause a "pause"? And why does this "pause" only appear in troposphere data, not in surface temps or ocean heat content or melting glaciers or changing growing seasons or sea level rise? That is the "pause" article I'd like to see. Looking forward to it, Sheldon. I notice that Monckton has changed the template for his monthly Pause report, in anticipation of the pause disappearing next month. I'm not sure how he can be so certain of this. RSS could be at 0.86C next month and he could still claim a pause starting in December 1997. The main question I'd like to see answered about the pause is whether you or Monckton has any statistically significant evidence that it exists. When it comes to warming, Monckton is very quick to show that a short period of warming might not be significant, but never mentions this with regard to his pause. yet doesn't see it as a problem that this fastest warming rate continues through the first half of his Great Pause. I'd like to know how he arrived at this statement when there are 15 year periods with a much greater warming rate? I've just written a new article about Monckton's fraudulent "pause". It's about to go away. He soon won't be able to claim even the RSS lower troposphere temperature graphs show a zero trendline. I wonder what deniers will do then? It will be interesting to watch. - Claim that it is only a spike in the data. They can run that one for a year or two. They will be massacred on that one because they will have to admit the 1997/98 measurements were only a spike as well. - Ignore it, just like they ignore other inconvenient evidence. - Claim the data has been manipulated to give a desired result. This will mean they will have to throw Dr Roy Spencer and Dr Christy under a bus. This did this to Richard Muller when he produced the Berkeley Earth results. On a denialist blog, I commented several months ago for them to watch out for a spike in the RSS data set due to the developing Great El Nino (which has since happened). If any of the other commenters actually understood what I was getting on, none were game enough to respond to my prediction. This did not surprise me. This new Independent Committee on Geoethics group makes me think they know the end is in sight for the satellite data cherry-pick, and they have come up with a new game plan. Looking at their Founding Statement, I suspect they intend to discredit and smear individual climate scientists and groups. It is the only card they have left to play. 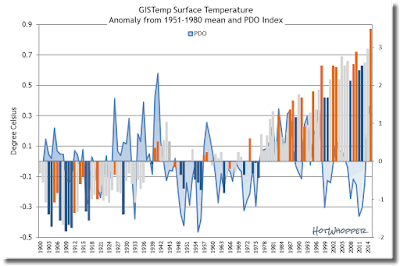 How do you distinguish between a "pause" and the normal variability inherent in a dataset such as mean annual (or even monthly) global temperature? You can use statistical concepts if you like. "For impacts on human society and the environment, the surface data are more important," Mears said. Mears said his analysis of his own satellite data has five times the margin of error of ground measurements. That's because satellites use complex mathematical algorithms and thousands of bits of code to translate wavelength measurements into temperature readings"
I've added an update to the article, referring to Sheldon's comment above. Hope I've got it right this time. Using HADCRUT4 regressed against CO2, TSI, AOD, AMO and Nino 3.4, I get +0.08 C for 2015 El Nino contribution. Telling the public that some part of the 2015 warming was caused by EL Nino is obviously a mistake. El Nino will eventually approach zero% causality of the 2015 warming as the real cause, ACO2/mankind, approaches 100% causality. A scientist tried to explain this on Climate Etc. He failed. El Nino is completely devoid of additional energy. It brings no new energy to the system. It can't warm anything. Quantify the energy El Nino brings that did not originate from the sun? It's vanishingly small. El Nino moves a packet of sequestered energy to the surface of the ocean. Sunlight interacts with it. La Nina bring a cooler packet of sequestered energy to the surface of the ocean, and sunlight interacts with it. El Nino results in more energy from the sun ending up in the GMST; La Nina results in a little less energy from the sun ending up in the GMST. From what I can see, ACO2 has caused those interactions between ENSO and sunlight to take place around an anomaly that is approximately .97C higher than it would have been without ACO2. 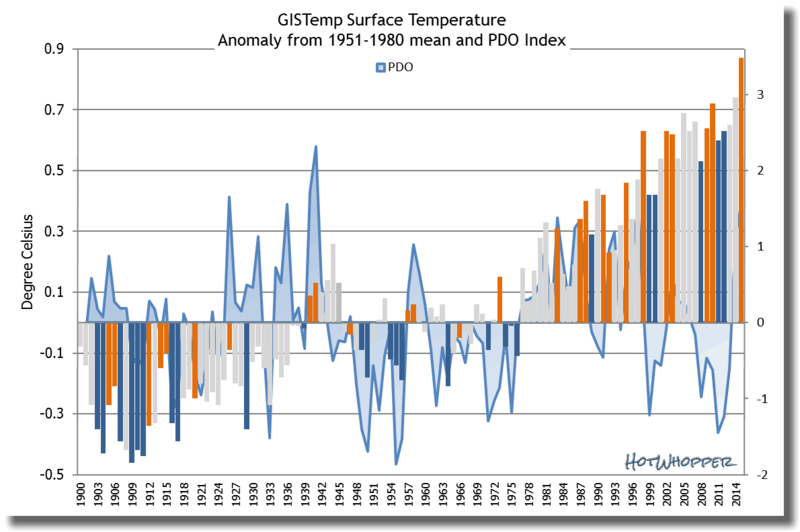 The positive phase of the PDO is associated with El Nino dominance, and the negative phase of the PDO is associated with La Nina dominance. As can clearly be seen, the shorter-term trends are steep, but as you go back in time, the PDO trend relaxes toward zero. The PDO ends up causing not much of anything. Seems like an odd argument to be making in any case. If you are assuming there is an underlying warming rate, then it becomes irrelevant which years are above and below the trend line. By definition if you remove all of the natural variability, each year will be the hottest ever because you are just left with the linear upward trend. Another clear mistake is the assumption that the global mean temperature is only determined by global warming and El Nino. I guess that is some progress over Bob Tisdale's sun fueled perpetual El Nino warming, but there are many more factors that influence the temperature estimates, especially for the short-term year-to-year variability. Interesting that Sheldon didn't also do a calculation for 1998 so that we could compare the two El Ninos. And of course it would be informative to show the temperatures *only* for El Nino years and look at their trend. Of course those figures will never appear on WUWT. Funny how they want to remove the 2015/16 El Nino but don't want to apply the same logic to previous El Ninos or La Ninas. If they were to do that they'd end up with exactly what Tamino has been harping on for the past 10 years. I noticed the WUWT post and the fact that Sheldon was repeating the same mistakes he made here, so I left the comment about it without giving it much more thought. This post demonstrates that even if Sheldon's reasoning didn't miss the point, it would still be trivial. It is not true that because the linear trend is .0175 degrees per year, the difference in temperature between December 2014 and December 2015 should be .0175 degrees. Other comments in this thread, the Climate Brief articles, etc. explain why. Leaving that aside, by only looking at the December 2014 and December 2015 data, the conclusion applies only to a single month. Sou's calculations show the absurdity of extending the conclusion to longer periods of time. The monthly variability in temperatures means that each month has a different percentage change in temperature due to global warming. It's closer to a meaningful result to ask what percentage of the change in annual temperature between 2014 and 2015 is due to global warming. But this is still missing the point. The real question is what percentage of the temperature change from the baseline to the present is due to global warming. This is the question addressed in the Climate Brief posts. If you discount the December 2015 temperature because of El Niño, the followup question is what will the temperature be after El Niño ends (say, in December 2016). Monthly variability can be quite large, so it's hard to guarantee a minimum, but it's easy to predict that it will be far above the 20th century average and, on average, rising. More concretely, the December 2014 anomaly was 0.78 degrees (using HadCRUT4, and I'm guessing the baseline is the 20th century average). There's a good chance December 2016 will be above that level. If we proceed directly to a La Niña, it's not unreasonable that it could drop to 0.6 degrees. (If that happens, will Sheldon post an article on WUWT stating that 120% of the drop from 2014 is due to La Niña?) Regardless of the observed temperature, we will be well above the 20th century average, and no amount of short term variability will change that. Looking at Sheldon's comments at WUWT, I'd say my original take on his article was correct. Sheldon was mixing up the notion of a difference between months (December) and years (2014 vs 2015). He seems to have got himself mixed up, like he did here in the other thread. It shows, because he didn't correct any of the other people at WUWT who got it wrong. The reverse IIRC. As I think more about Sheldon's post and comments, I feel like I don't understand what he's doing. On the one hand, he says the global temperature has increased by 0.72 degrees since 1975. As he says, that doesn't sound like a denier. On the other hand, he wrote a guest post for WUWT, and when Carbon Brief came to a different conclusion than him, he implied it was a conspiracy. Which does sound more like a denier. My current guess is that Sheldon understands so little of this that he doesn't understand what he doesn't understand. So he takes the data at face value, but then sets off to do his own analysis, and he isn't aware of the faulty assumptions that he's making. And when he can't follow someone else's argument, he assumes they must be mistaken. But then I'm left with the question of why would someone with so little understanding set out to write articles to be posted at WUWT? And then I get stuck, because I have no further explanation of his motives. I suspect he was attempting to construct a Gish Gallop. For a Gish Gallop to appear plausible, it has to contain a bit of truth. Why post in a known denialist blog? It is hard to speculate about motivations but attention-seeking is likely. If he is convinced the 2015 temperature record is incorrect or unimportant for ideological reasons then "the end justifies the means" could be the motivation. Sou, one more thing: in your graph of El Niño temperatures and La Niña temperatures, you use cubic fits. Polynomial fits tend to be very unstable near the endpoints and should be avoided. Even though the temperature change is not linear over the entire time period, the linear fit is more stable, and therefore generally more informative. If you are not satisfied by that, you are better off using a nonparametric fit (like LOESS) or a piecewise linear fit, rather than a polynomial fit. I don't disagree, OSMM. The lines were just to help the eye because of the messy looking scatter plot. P'raps I could have been more explicit, instead of merely hinting at that in the text above. Re linear trend lines, there are at least three change points over that period for all the years (not just ENSO years). I could have plotted three different trend lines for each of El Nino and La Nina, making six trend lines and two scatter plots. The result would have looked very messy. There were not enough data points (too many gaps between ENSO years) for LOESS curves in my view. The chart isn't integral to the article. It was a bonus. As Steve Mosher said, "just for grins". People can make of it what they will. The Worlds Collide at WUWT - Astronomy is a Hoax! How does the earth balance energy?